RAINFOREST BLEND: Our certified organic, Rainforest Blend is an artful mix of coffees from Colombia, Mexico, Guatemala & Indonesia that produces a smooth, full-bodied taste with lively citrus notes. A delightful cup of coffee for an afternoon pick-me-up. OUR ONECUP COFFEE PODS are compatible with most Keurig K-Cup 1.0 & 2.0 brewers, Cuisinart, Bunn, iCoffee and other single serve brewers. Our OneCups are the better choice of coffee for your single serve brewer, and the environment, all at a lower cost. COFFEE FOR EVERY OCCASION: We offer a wide selection from whole bean coffee to ground coffee, flavored coffee to decaf coffee, and much more. Plus, we select and roast only the finest beans so that every sip of your coffee exudes the best flavor and aroma. QUALITY COFFEE FROM A FAMILY COMPANY: The Rogers Family Company's mission is to search out the finest Arabica varieties and roast the richest, most flavorful coffees available anywhere while making the world a better place one cup of coffee at a time. 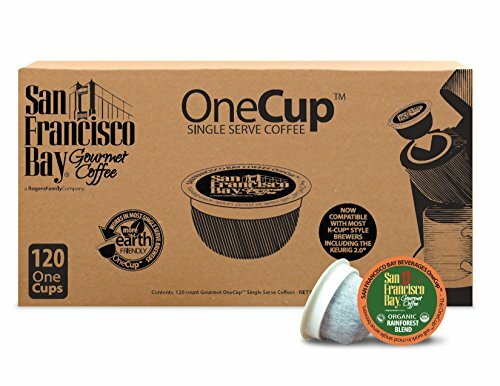 START THE DAY RIGHT: Try San Francisco Bay OneCup K-Cup pods if you've enjoyed coffee from Keurig, Nespresso, Starbucks, Lavazza, Peets, Walden Farms, Donut Shop, Green Mountain, Café Bustelo, Folgers, McCafe, Gevalia, Nutpods, Tassimo, or Mount Hagen.